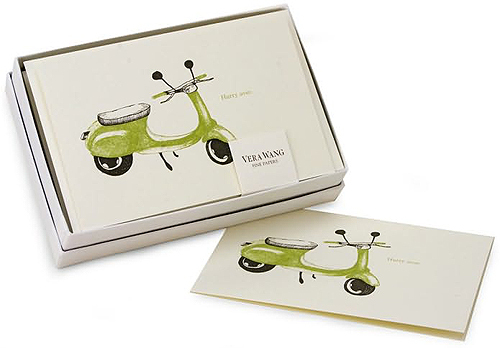 These note cards have been available at Barnes & Noble for quite awhile and we featured them as part of a post about Vespa marketing at this store awhile back. But now they’re available online. I think the Vespa in the illustration could almost be a Triumph Tina but I digress. Printed on beautiful British made stationary, these cards are engraved with the message “Hurry Over” and are $24 for a set of 10. This entry was posted in Stationery and tagged barnes and noble, scooter, stationary, vera wang, vespa by Tracy. Bookmark the permalink.